Krishterimi �sht� ��shtje jete, e jet�s s� Krishtit. Ti zot�ron nj� jet� t� re dhe jan� reagimet e jet�s s� Tij p�rbrenda q� duhet t�i marr�sh parasysh kur duhet t� vendos�sh p�r kurse t� ndryshme veprimi. Ti nuk duhet t� pyes�sh: �A �sht� e drejt� ta b�j� k�t�?�, por: �Si do t� ndikoj� kjo n� jet�n e re brenda meje?� Kjo broshur� zbulon se si zbatohen n� jet�n tuaj sot dy pem�t te Zanafilla 2. Nga Uo�m�nNi?, 20 faqe, botuar ne shqip nga LSM? ? Christianity is a matter of life, the life of Christ. You possess a new life, and it is the reactions of His life within that you have to consider when you must decide between various courses of action. You should not ask, �Would it be right to do this?� but, �How will this affect the new life within me?� This booklet unveils how the two trees in Genesis 2 apply to your life today. 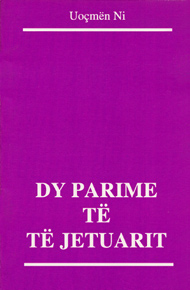 By WatchmanNee?, 20 pages, published in Albanian by LSM?